Nola Bunny is a performance artist and model specializing in freestyle/ Go Go dancing. She has many years of experience and has performed at many different venues/scenes in NYC night life. She can provide her own costumes and has the ability to dance to any type of music. She understands the importance of stage presence and has a lot of energy. In Spring 2015, she developed a performance art piece called Splash Dance which is now her specialty act at events. A plain white sheet becomes her stage, and she graces the sheet in a plain white outfit. Surrounding the sheet are different colors of tempera paint. Improvisationally, Nola paints the sheet with her body through dance and emotion. Nola is very professional, top notch talent. Highly recommend! When working with Nola Bunny, expect a high energy, reliable performer that is always on time and gives each gig her all. No matter how big or small the audience is, Nola Bunny is sure to hold their attention. She provides her own costumes. She can perform to any style of music and can relate to any age group. Nola Bunny has been an artist her entire life. In her late teens, she began studying free style dancing. She taught herself to flow, and she took up Go Go dancing in 2012. Since then, she has performed at many clubs and events like Webster Hall, Slake, and EDC NY. She has been a freelance model since she was 18 years old. She gets a joy out of becoming a character and creating an image. She is a face painter with event coordinator group, 'A Party with a plan' but she is always available to freelance. Creating is her passion and she is always looking for the next place to share her magic. If interested in Nola Bunny's Splash Dance, please be aware that this performance involved water based paint. If this is done indoors, it is probably best to have a large tarp for her to perform on. She would need enough space for a tarp and the sheet she performs on. 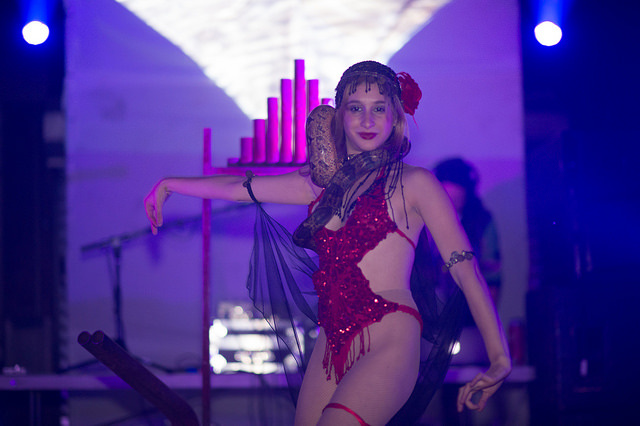 Nola Bunny also has the ability to perform with snakes, but she does not own one herself. If interested in Nola Bunny acting as a snake charmer at your event, please give her enough time in advance to contact a snake handler. Nola Bunny's freestyle dancing comes off as similar to a belly dancer. She took classes for about a year, and her flow developed from there. Her Splash Dance came to be because she was looking for a way to blend her performance art and visual art.